These Conditions may be modified from time to time and you should regularly review these Conditions. Your continued use of the Website and our services constitutes your agreement to these Conditions and any modifications to them. If you do not agree to, or cannot comply with, these Conditions, do not use the Website. The Website, listings, advertisements and template websites created and published by our Advertisers on the Website, may contain links to other third party websites for your convenience and information. Coastal Stays Australia Pty Ltd (Coastal Stays Australia) does not endorse, and is not responsible for, the content, accuracy or opinions expressed on such websites, and such websites are not necessarily investigated, monitored or checked for accuracy or completeness by Coastal Stays Australia. Inclusion of any linked website on the Website does not imply approval or endorsement of the linked website by Coastal Stays Australia. When you access third party websites, you do so at your own risk. We suggest that you review the terms and conditions and privacy policies of each third party site you visit. The Website may contain advertisements for third parties’ goods and/or services. The third party advertisers (Advertisers) are fully responsible for the accuracy of all representations made in those advertisements. Coastal Stays Australia takes no responsibility for the goods and/or services provided by the Advertisers on the Website, and is not responsible for the conduct, whether online or offline, of any Advertiser or user of the Websites. If you choose to order a product or service advertised by an Advertiser on the Website, you do so at your own risk. You acknowledge and agree that Coastal Stays Australia acts as a passive conduit for your online participation with the Website. No goods or services are directly sold by Coastal Stays Australia through the Website. Coastal Stays Australia is not acting as an agent for any party, merchant or supplier and does not sell, re-sell or license any goods or services listed. Coastal Stays Australia is not involved with, or a party to any transactions that take place between you and any third party. Coastal Stays Australia is not, and can not, be involved in user-to-user dealings and / or control the behaviour of participants on the Website. Coastal Stays Australia provides an availability calendar for use by accommodation and service providers who advertise on the Website, and it is the responsibility of the accommodation provider to maintain the accuracy of their calendar. Coastal Stays Australia does not accept any liability for unavailability of rooms due to an availability calendar being incorrect or out of date, or for any other reason. When you make a Booking Reservation, your booking is not confirmed until you have received a confirmation email or phone call from the Accommodation Provider. This is usually within 24 hours of receipt of your online booking request. The accommodation provider will make independant arrangements to take your payment. Coastal Stays Australia is not involved with or any party to any transactions that take place between you and any third party (accommodation or service provider). By clicking the "Confirm Booking" and using the Coastal Stays Australia website to book accommodation online you expressly agree to accept the following terms and conditions contained in this agreement. Subject to confirmation by the accommodation provider and also to your credit card information for payment being valid and correct, your booking will be irrevocably binding once you have clicked the 'Confirm Booking' button on our website online booking payment form. Your will receive a confirmation of your booking from us via email, so it is your responsibility to provide us with an accurate email address. The confirmation email will usually be sent within one business hour after you have submitted your booking. If you do not receive the confirmation email within one business hour, please email bookings@coastalstays.com with details of your booking. The confirmation email you receive from us will serve as proof of valid booking and will contain relevant information about your booking and about the accommodation provider. Please read and check carefully all the information contained in the confirmation email to ensure that it conforms to your booking. You are also required to print and produce this confirmation email when you check in at the accommodation, along with a valid credit card, and valid photo ID. You must be at least 18 years of age to book any accommodation on any Coastal Stays Australia or accommodation provider's web sites using this booking system. In order to secure your booking, accommodation providers require your credit card details, such as its number, CCV and expiry date. When you book online, we send your credit card details directly to the accommodation provider at which your booking is made, and your credit card may also be verified (pre-authorized). Some accommodation providers on our website also require a deposit to confirm your booking. This will be clearly noted on the booking form, before you click "Confirm Booking". If the accommodation provider requires a deposit to confirm your booking, this will be charged directly by the accommodation provider on receipt of your booking request. You will be required to provide a credit card at accommodation check-in to cover incidental charges and may also be required to provide valid photo ID. You should also print the Confirmation Email you receive from us and present on arrival at your accommodation in order to expediate processing. All booking amounts displayed on the Coastal Stays Website are in Australian Dollars (AUD). Depending on your credit card's currency and the country in which your card was issued, your credit card provider may impose foreign exchange fees and other fees which are in accordance with your arrangements with that credit card provider. Under no circumstances will Coastal Stays Australia or the Accommodation Provider be liable for any kind of fees that your bank might charge you. The outstanding balance of the accommodation booked, as well as additional charges that may be incurred during the stay at the accommodation, will be settled by the guest. By making a booking through our website you are deemed to have unconditionally and irrevocably authorized and consented to our release of your credit card information to the accommodation provider concerned for this purpose. In order to safeguard and encrypt your credit card information when submitted on our site, we use the "Secure Socket Layer (SSL)" technology for our services. Coastal Stays Australia provides a service to sell accommodation from an inventory supplied by each accommodation provider, and does not oversell that inventory. Coastal Stays Australia does not accept any liability for unavailability of rooms caused by the accommodation provider over-selling their own room inventory. Coastal Stays Australia receives an annual payment from accommodation providers for the provision of the Coastal Stays Australia online booking service. Coastal Stays Australia is not acting as an agent for any party, merchant or supplier and does not sell, re-sell or license any goods or services listed. Coastal Stays Australia is not involved with, or a party to any transactions that take place between you and any third party. Coastal Stays Australia is not, and can not, be involved in user-to-user dealings and / or control the behaviour of participants on the Website. Cancellation penalties depend on individual accommodation provider's policies and are subject to change. The cancellation policy is made available in the online booking area of the accommodation provider's page, and is also provided in the confirmation email. You should read the cancellation policy and booking terms of the accommodatin provider carefully before making your booking, even if you have booked through our website previously, as once you have clicked the "Confirm Booking" button you will be bound by these terms and policies. The cancellation policy and terms of the accommodation provider will be included in the confirmation email for your reference. If you would like to review, amend or cancel your booking, please revert to the confirmation email and follow the instructions provided. Please note that you may be charged for your cancellation as per the accommodation provider’s cancellation and no-show policy. Please review the cancellation and no-show policy of each accommodation provider carefully prior to making your booking, as policies may vary between accommodation providers and are subject to change. Coastal Stays Australia is not involved with or any party to any transactions that take place or any disputes that may arise between you and any third party (accommodation or service provider). No claim whatsoever shall be made by you against us in respect of any penalty or charges made by the accommodation provider concerned for your cancellation or amendment of any booking you have made using our website. Coastal Stays Australia does not apply any administration charges to booking changes or cancellations. The Website Content is protected by copyright, trade mark and other intellectual property laws. Subject to this clause, the owner of such content placed on the Website retains any and all rights that may exist in such content. 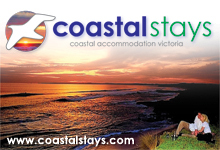 The Coastal Stays Australia logo and name are the property of Coastal Stays Australia Pty Ltd, and may not be used as part of your business or in connection with any goods and services without the prior written consent of Coastal Stays Australia. The Website Content is the property of Coastal Stays Australia and its content suppliers and Advertisers. Coastal Stays authorises you to view and access a single copy of the Website Content available on or from the Website subject to the prohibitions and limitations in these Conditions. For the purposes of the Conditions, “Website Content” means any information, text, materials, graphics, logos, button icons, images, video and audio clips, trade marks (whether registered or not), advertisements, layout, arrangement, graphical user interface, look and feel, and control features of the Website. Coastal Stays Australia assumes no responsibility for any error, omission, interruption, deletion, defect, delay in operation or transmission, communications line failure, theft or destruction or unauthorised access to, or alteration of, any user or advertiser communication. Coastal Stays Australia is not responsible for any problems or technical malfunction of any telephone network or lines, computer online systems, servers or providers, computer equipment, software, failure of any email due to technical problems or traffic congestion on the Internet or on the Website or combination thereof, including any injury or damage to any users or to any person's computer related to or resulting from participation or downloading materials in connection with the Website. any dispute you have with an Advertiser. Coastal Stays Australia and its personnel are not liable for any direct or indirect damages or loss (including, without limitation, incidental and consequential damages, lost profits, or damages resulting from lost data or business interruption) resulting from the use or inability to use the Website and the Website Content, whether based on warranty, contract, tort (including negligence), or any other legal theory, and whether or not Coastal Stays Australia is advised of the possibility of such damages. Without limiting the above paragraph, Coastal Stays Australia does not accept any liability in respect of your involvement in any mediation, arbitration, tribunal hearing, court proceeding or other proceedings (of whatever nature) with any Advertiser in any way. The Website is provided "AS-IS" and as available and Coastal Stays Australia expressly disclaims (to the fullest extent permitted by law) any warranty (whether express or implied) of fitness for a particular purpose or non-infringement in respect of the Website and any goods and/or services advertised on it. that the Website will operate error-free or that the Website and its server are free of computer viruses or other harmful mechanisms. These Conditions are governed by the law of the State of Victoria. The parties submit to the non-exclusive jurisdiction of its courts and courts of appeal from them. The parties will not object to the exercise of jurisdiction by those courts on any basis. Each provision of these Terms is individually severable. If any provision is or becomes illegal, unenforceable or invalid in any jurisdiction it is to be treated as being severed from this document in the relevant jurisdiction, but the rest of this document will not be affected. The legality, validity and enforceability of the provision in any other jurisdiction will not be affected. Whilst the information contained within the Website is deemed to be correct no responsibility is taken by the publisher and no claims will be entered into. Thank you for your cooperation. We hope you find the Website helpful and convenient to use. If you have questions or comments regarding this website please contact us on www.coastalstays.com/contact/ or email webmaster@coastalstays.com. If there are any technical problems with this Website, go to contact us on www.coastalstays.com/contact/ or email webmaster@coastalstays.com. This document last updated August 2010.